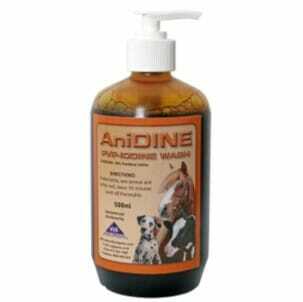 Anidine Wash is a shampoo specifically formulated with PVP Iodine as a powerful antiseptic to cleanse the skin and coat. Providone-Iodine is a water-soluble complex of iodine and polyvinylpyrrolidone used for its general antiseptic properties. Povidone-Iodine retains the antimicrobial spectrum of iodine without the disadvantages of stainign, irritation or toxicity. It is ‘tamed iodine’. On contact, iodine is released to diffuse into micro-organisms where it interferes with their vital metabolic processes, killing them rapidly. The povidone-iodine in Anidine is effective against bacteria, fungi and viruses within one minute. Bacterial spores are killed within 15 minutes. The germicidal activity is maintained even in the presence of blood, serum, pus and soap. Povidone-iodine may be left in contact with tissue for long periods without ill effect. It may even be used underneath bandages. The Anidine range includes both wash and spray versions. Shake the bottle well, wet the animal, apply shampoo, and lather well, leave for 10 minutes, wash off throughly.